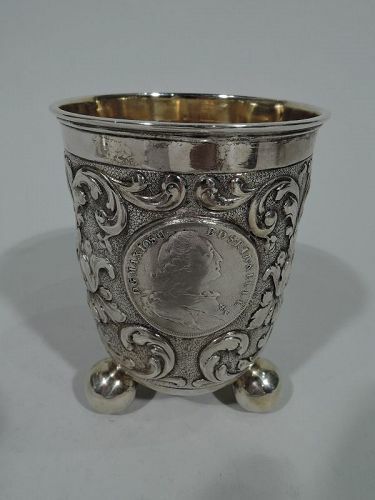 German Baroque-style 830 silver beaker, ca 1900. Straight sides and curved bottom mounted to 3 outsized balls. Fluid flowers and scrolls frame inset coins with coats of arms and Classical busts encircled by Latin mottoes. Coins double-sided (that is, the other side is visible on interior). Stippled ground and gilt interior. Fully marked. 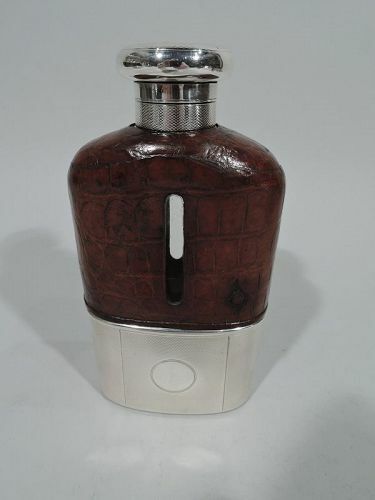 Very good condition with rich patina. 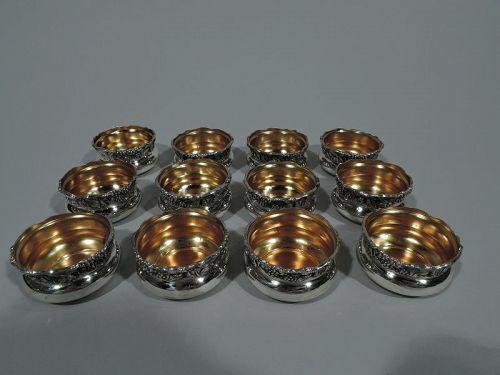 Set of 12 pretty Art Nouveau sterling silver open salts. 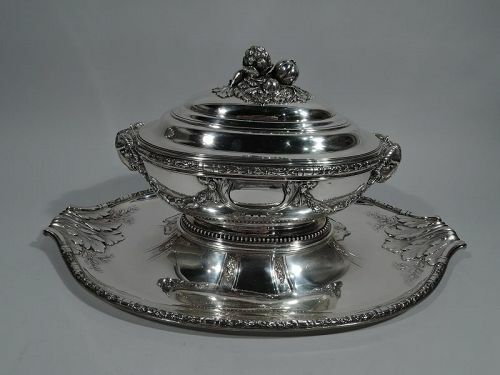 Made by Webster in N. Attleboro, Mass., ca 1900. Each: Bellied bowl on inset foot ring. Rim has tooled leaves and berry bunches. Interior gilt. Hallmarked. Very good condition. 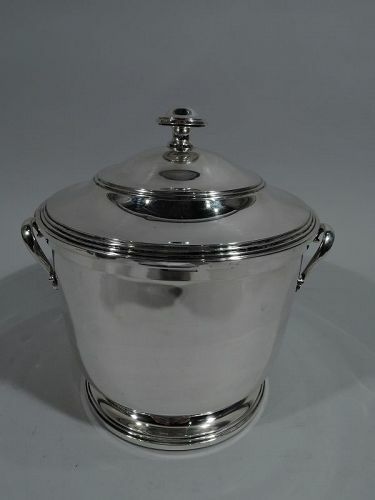 Large Belle Epoque 950 silver tureen on stand. Made by Claude Doutre Roussel in Paris, ca 1900. 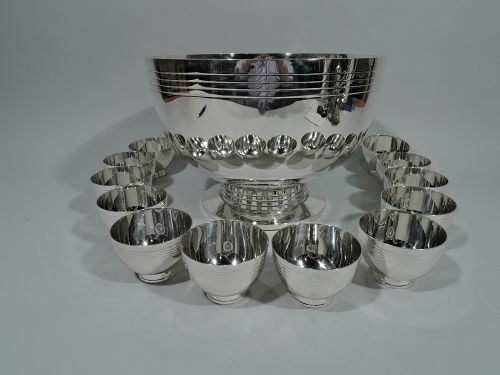 Tureen: Ovoid with curved sides and raised foot. Cast ram head end mounts and applied imbricated leaf swag. Two shaped and scrolled frames (vacant). Beading. Domed cover with cast leaf-mounted vegetable finial. Stand: Ovoid with shaped and scrolled ends applied with stippled acanthus leaves. Rim has imbricated leaves alternating with abstract bead-and-reel. Raised center. 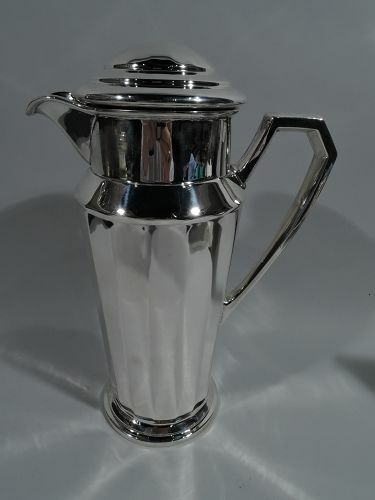 Craftsman sterling silver water pitcher. Made by Whiting in New York in 1922. 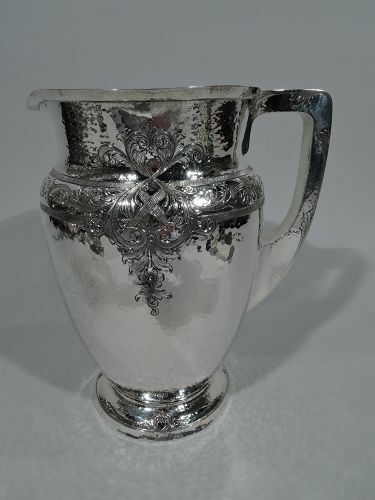 Tapering and curved body, short neck with lip spout, scroll bracket handle, and raised foot. Allover honeycomb hand hammering with chased and engraved flowers and leafy scrolls spilling over beaded borders. 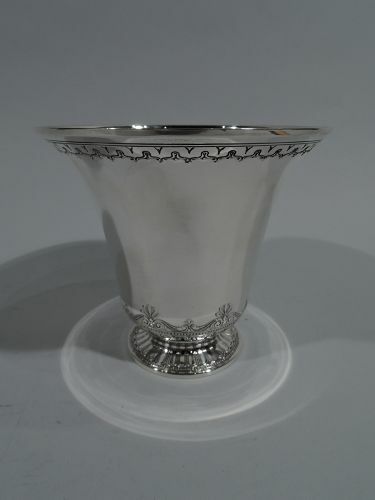 An attractive example of the enduring popularity of the Arts & Crafts Movement by a major American maker. Fully marked including date symbol, no. 1385A, and volume (5 1/2 pints). Very good condition. 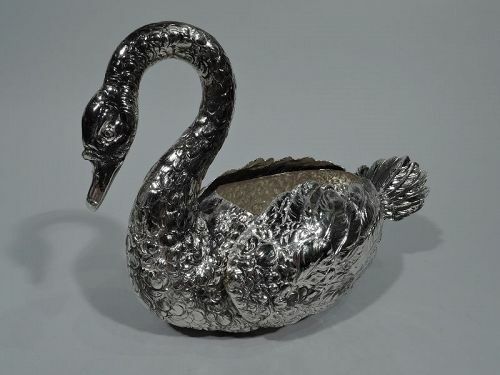 German 800 silver swan, ca 1900. Ovoid body, s-scroll neck, and erect tail. Nicely delineated feathers from plumes to down. Wings hinged for swift flight. Body hollow for holding treats. Fully marked. Very good condition. 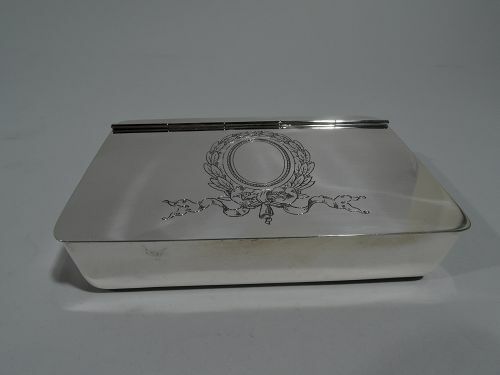 Edwardian sterling silver jewelry box. Made by Reed & Barton in Taunton, Mass., ca 1920. Rectangular with curved corners and flat, hinged, and overhanging cover. On cover is engraved laurel wreath with ribbon (vacant). Interior has detachable velvet lining. Fully marked. Very good condition. 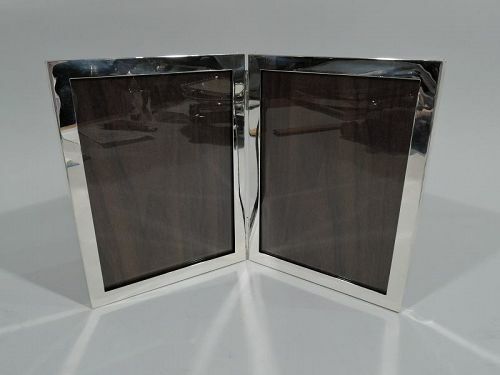 Modern sterling silver diptych picture frame. Two hinged rectangular windows with flat surrounds. With glass and wood laminate back. Fully marked including maker’s and retailer’s stamps. The maker was Hickok-Matthews, a Newark maker better known as Lebkuecher, which was its original name. Numbered 425/2. Very good condition.